At the Repository step of the wizard, specify path and load control repository settings. In the Location section, specify a path to the folder where backup files must be stored. Click Populate to check capacity and available free space in the selected location. For Dell EMC Data Domain, click Browse and select a location from the list of available paths. For HPE StoreOnce, select a Catalyst store from the list. Use the Load control section to limit the number of concurrent tasks and data ingestion rate for the backup repository. These settings will help you control the load on the backup repository and prevent possible timeouts of storage I/O operations. Select the Limit maximum concurrent tasks check box and specify the maximum allowed number of concurrent tasks for the backup repository. If this value is exceeded, Veeam Backup & Replication will not start a new task until one of current tasks finishes. For more information, see Limiting the Number of Concurrent Tasks. Select the Limit read and write data rates to check box and specify the maximum rate to restrict the total speed of reading and writing data to the backup repository disk. For more information, see Limiting Combined Data Rate for Backup Repositories. The Limit read and write data rates to settings does not apply to health checks performed as part of backup and backup copy jobs. Even if you limit read/write rate for a backup repository, the health check will consume resources of the backup repository regardless of this setting. Bear this limitation in mind when configuring basic and health check schedules for backup and backup copy jobs. For storage systems using a fixed block size, select the Align backup file data blocks check box. Veeam Backup & Replication will align VM data saved to a backup file at a 4 KB block boundary. This option provides better deduplication across backup files but can result in greater amount of unused space on the storage device and a higher level of fragmentation. When you enable compression for a backup job, Veeam Backup & Replication compresses VM data at the source side and then transports it to the target side. Writing compressed data to a deduplicating storage appliance results in poor deduplication ratios as the number of matching blocks decreases. To overcome this situation, select the Decompress backup data blocks before storing check box. If data compression is enabled for a job, Veeam Backup & Replication will compress VM data on the source side, transport it to the target side, decompress VM data on the target side and write raw VM data to the storage device to achieve a higher deduplication ratio. 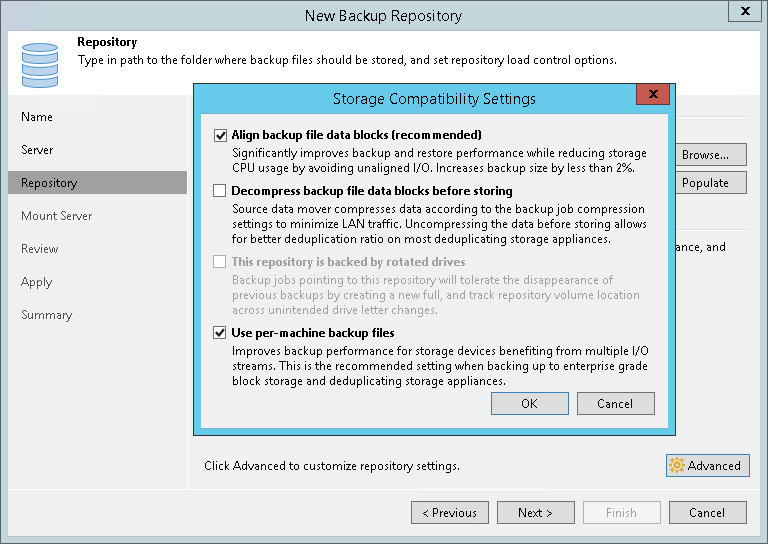 If you plan to use rotated drives for the backup repository, select the This repository is backed by rotated hard drives check box. 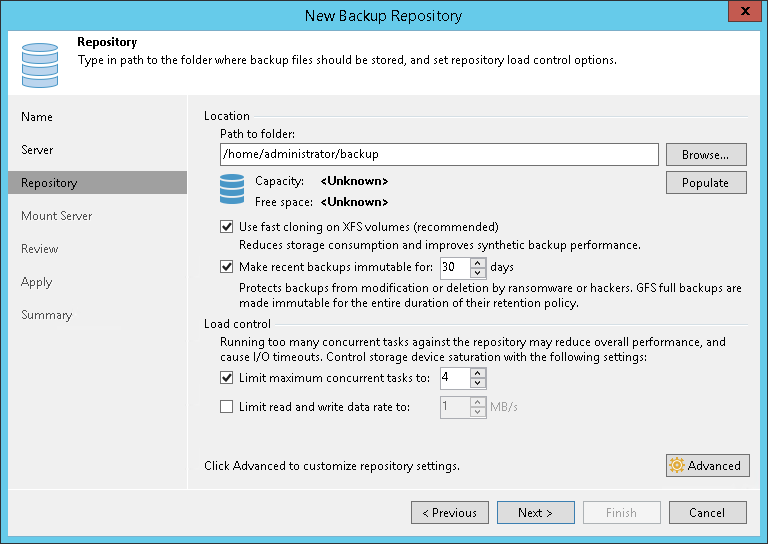 For more information, see Configuring Backup Repositories with Rotated Drives. To create a separate backup file for every VM in the job, select the Use per-VM backup files check box. This setting is recommended if you use a deduplicating storage appliance as a backup repository. Veeam Backup & Replication will write VM data to the backup repository in several streams, which will improve the backup job performance. However, in this case Veeam Backup & Replication will not deduplicate data between VMs added to the job. For more information, see Per-VM Backup Files. The Align backup file data blocks option is disabled by default. The Decompress backup data blocks before storing option is enabled by default. The This repository is backed by rotated hard drives option is disabled. The Use per-VM backup files option is enabled by default. The Align backup file data blocks option must not be enabled. The Decompress backup data blocks before storing option is disabled by default. The This repository is backed by rotated hard drives option is disabled by default. The Use per-VM backup files option should be enabled. Limit max concurrent tasks is equal to 10 (recommended, by default). The Use per-VM backup files option is enabled.